Greenville was once such a prolific producer of textiles that it was called the “Textile Capital of the World.” Even so, Monaghan Mill stood out from the city’s many other mills due to its village design and operation. The textile manufacturing company was founded in 1900 by cousins Lewis Wardlaw Parker and Thomas Fleming Parker with financial backing from the cousins’ grandfather, Thomas Fleming. The Parker cousins named the mill for their grandfather’s homeland of Monaghan, Ireland. 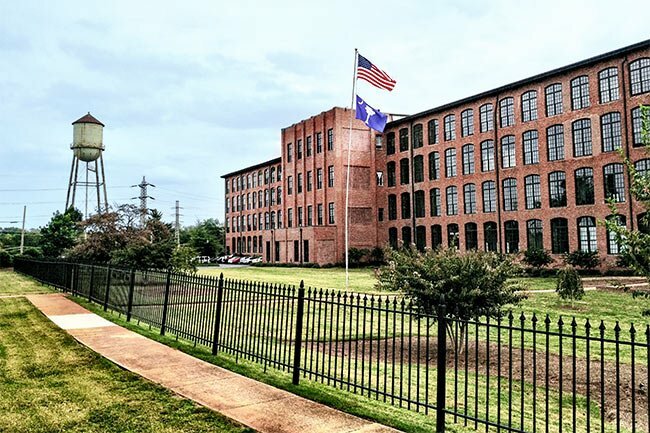 With sound business advice from Francis W. Poe, whose Poe Manufacturing Company was one of Greenville’s most successful textile plants, the Parkers began operations in 1901 with 25,000 spindles. Within two years Monahgan Mill more than doubled its number of spindles with 60,000 along with 1,500 looms. The village surrounding the mill was also being developed during these early years for its then-700 employees. The Parker cousins were intent on creating an environment that encouraged mill workers to become educated, physically healthy, and spiritually fulfilled. Children younger than twelve were prohibited from working in the mill and attended the Monaghan School, and the village included a medical clinic complete with a nurse to care for mothers and infants. Monaghan Baptist Church was built for mill workers in 1901, and in 1904 Thomas Parker added a Young Men’s Christian Association (YMCA) to the village, the first ever in a Southern mill town. A Young Women’s Christian Association (YWCA) followed in 1907. Pete Hollis, director of the YMCA at the University of South Carolina, was hired to run the Y facilities at the mill. Hollis was known for bringing the sport of basketball to South Carolina after learning of the game at a conference in New York. It was first played in the Palmetto State in the Monaghan Mill gymnasium in 1907, and a textile basketball league soon followed. He also organized the state’s first Boy Scout troop. Along with being an effective director, Hollis was a respected educator and served as superintendent of the Parker School District, which was formed in 1922 and included fourteen industrial communities. It was named for Thomas Parker, as was Parker High School, founded in 1923. 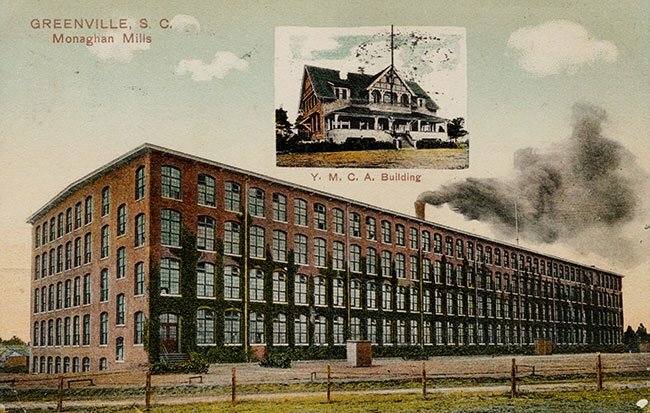 As the Parker cousins went on to acquire more mills under the company name Parker Mills, including Olympia and Granby mills in Columbia, Hollis eventually became the director of both recreation and education at all Parker-owned mills. The cousins’ efforts in developing a healthy community within the Monaghan Mill village resulted in a fiercely loyal workforce. When the United Textile Workers planned a strike for September 3, 1934 for the entire eastern United States, 795 of Monaghan Mill’s 800 workers signed a statement refusing to strike. While violence erupted in many mills during the 1934 strike – including the killing of seven people at Chiquola Mill in nearby Honea Path – production continued peacefully at Monoghan. The mill was sold to J.P. Stevens in 1946, and the new owners ran the mill differently than the Parkers. Whereas employees had previously rented houses from the company, with their utilities, home repairs, and home security paid for by the mill, the Stevens Company sold the homes to workers, and amenities were no longer included. The Monaghan School burned in 1954, and many of the recreational facilities were torn down or removed in the 1960s. The mill continued to be successful despite the changes until the 1970s, when textile work began to be outsourced to foreign companies. In 1988 Monaghan Mill was sold to JPS Textiles and continued operations until 2001, when the mill finally ceased production after 100 years. 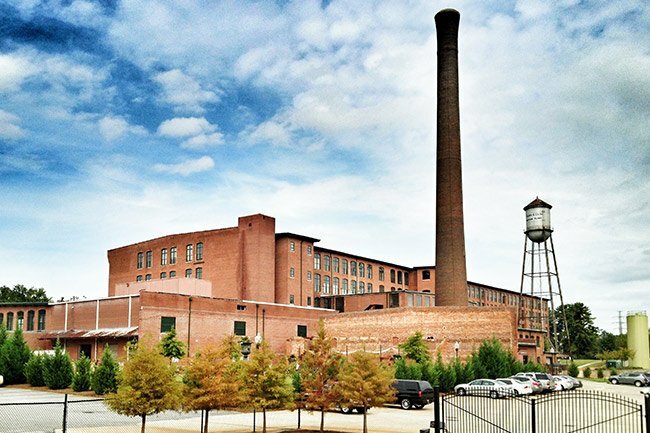 In 2004 the former mill was purchased by The Lofts of Greenville, which converted the building into luxury apartments that opened in 2006. 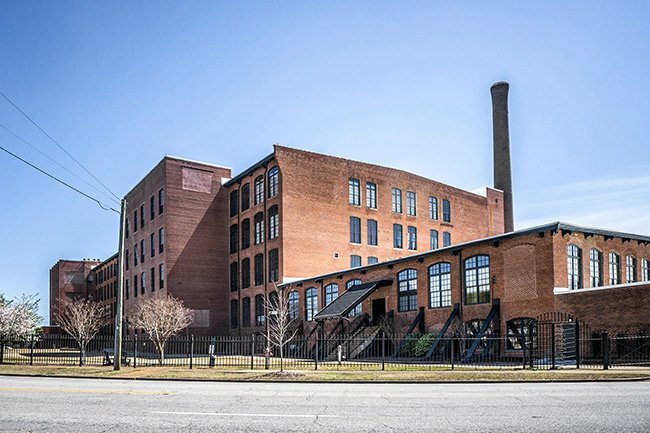 Monaghan Mill is significant for its association with the development of the textile industry in Greenville County from 1900 to 1946 and as an excellent intact example of cotton mill engineering and design at the turn of the twentieth century. Monaghan Mill was established in 1900 by first cousins Lewis Wardlaw Parker and Thomas Fleming Parker, who received financial support from their grandfather Thomas Fleming and advice from Francis W. Poe of the F.W. Poe Manufacturing Company, one of the leading textile manufacturers in the South. The Parkers named their new mill Monaghan after their grandfather Fleming’s native county in Ireland. From the start, the Parkers’ goal was to make Monaghan Mill and its village a model of enlightened paternalism. The main mill building, designed by Lockwood, Greene and Company, has a rectangular plan with four stories over a basement. The mill is constructed of brick perimeter walls laid in common bond and heavy timber framework. Cast iron columns support interior floors and are designed to carry the weight of heavy textile machinery. Two four-story blocks were constructed in the 1940s to accommodate modern equipment. Major spaces include a basement containing much of the mill’s original maintenance equipment, a two-story boiler room and two bathroom towers on the rear elevation, and three freight elevators servicing its main floor and basement. A smokestack, water tower, pond, and elements of historic landscaping all contribute to the historic character and significance of the property. Really great website for local and nearby history. Please keep it alive.